© 2010 by Jessica Ackerman; All rights reserved; content may not be copied, rewritten, or republished without authors written permission. Your bedroom should be a restful place to turn in for the night and a refreshing environment to welcome the day. Updating your bedroom can easily be accomplished with the use of great fabric and a sewing machine. If you can sew a straight line, you can try your hand at creating new looks for your curtains, bedding, and skirts for your side tables. Use similar material or colors to unify the decor in the room. 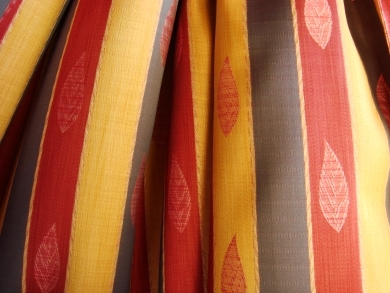 First determine the measurements of the fabric you will need to make your curtains. To obtain the length, measure from the curtain rod to the floor and add your desired lengths for the top rod pocket and bottom hem. To obtain the width of the fabric, measure the width of your window and add four inches. Cutting your fabric according to these measurements will make up one curtain panel that will cover half the window. Start by sewing the side hems. Placing the fabric right side down, fold in half an inch from the long edge and iron flat, then fold another one and a half inches over to create the hem. Iron and sew in place. Next, make the top pocket for the curtain rod. Fold in half an inch from the top edge, iron, and fold over the length that is needed to accommodate the curtain rod. Iron and sew the seam. Lastly, create the bottom hem by folding in half an inch from the bottom, then the fold over the length of the hem, usually three to five inches. Iron and sew in place. Repeat to make the second curtain panel. Table skirts are especially good for bedside tables that dont really coordinate with the rest of your bedroom furnishings, or if you want a refreshing look for your tables. Practically, it is a great way to add storage and hide unsightly clutter. Select a fabric that complements the room colors. Simply cut the fabric to size and sew the hems to finish your table skirt. To hide a box spring or create a finished appearance for your bed, a bedskirt does the job effectively. First measure the length and width of the box spring and add an inch to each measurement. Cut an old flat sheet or cheap fabric according to this size. Next, measure the height of the box spring, adding one inch, and take three more measurements, along the two lengths and along one width of the box spring. Cut your bedskirt fabric into three pieces, according to the measurements of the two sides and the one end, adding a one-inch seam allowance. Finally, sew a hem on each of the bedskirt fabric pieces, and attach them to the old flat sheet. You can decide whether to join the sides of the bedskirt after they are sewn together, or leave them open. Artist, Jessica Ackerman, is a consultant with WallDecorandHomeAccents.com and describes how to decorate with large wall cross and metal fish wall hanging. Website © 2010 Kelly Smith. Article © 2010 Jessica Ackerman ; All rights reserved; content may not be copied, rewritten, or republished without authors written permission.